Making coffee to taste like what your espresso vendor delivers needs you to invest in a good grinder. That is what stands in the way between you and good brewing experience. Since some high-grade grinding units may cost an arm and leg, you may want to consider the best espresso grinder under 100 dollars. To tell you the truth, they are not the best thing to have in the house, but most of them get the task done. You will actually be surprised by how some cheap grinders can make all the difference. On the other hand, you need to watch out for units that will break down after a few months of use. Even while investing under $100 for an espresso grinder, that does not mean it should not last long. That is why you need to go through the reviews and the guide below and see what suits a budget coffee drinker. If you are eager to see what the reviews hold, I have prepared a table for you to check what the grinding units entail. It is essential to note that these coffee grinders are meant for those of us who are not yet ready to commit to the pricey models. Buying the Cuisinart DBM-8 Supreme Burr Grinder means that you will have 18 positions to select the kind of grind you want to brew. By the looks, it is a stylish stainless steel espresso grinder that is convenient to use and store. For you to achieve the grinding positions, you need to rotate the bar slide where the bean hopper sits. That way, you can select the between extra coarse and ultra-fine grinding. After selecting, the heavy duty motor will do the rest. As for the hopper, it’s removable and holds 8oz. of coffee beans, but some have testified putting up to 10oz. That is enough for the next 32 cups of coffee that you are going to brew. 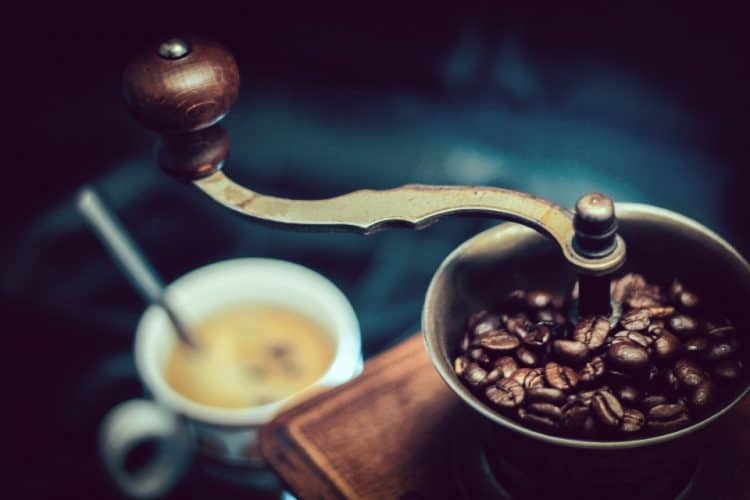 Since it’s essential to grind more coffee for later use, storing it needs you to apply the best mechanisms to ensure that ground coffee does not lose its flavor. The grinding chamber is removable, but you cannot use it to store the coffee. After the grinding is over, the auto shut off feature switches off the machine, so you don’t have to do it. On the other hand, if you want to grind enough for a single cup, Cuisinart will make that possible. You, however, need to deal with the number of times you’ll have to clean the unit after use. That is one of the issues that customers deal with when they choose this grinding unit. We cannot ignore the complaint that it is advertised as a burr grinder, but you get other results after purchasing. It uses flat metal grinding disks which are not bad for daily use, but a coffee aficionado knows that burr grinders work better. It is also loud to use which is expected for an automated grinder. Some users say that it will not last long, but with proper care and maintenance, it’s a unit guaranteed to grind for years. For those of us who like a hand crank, welcome to JavaPresse Manual Coffee Grinder that surprises many with what it can do with its small body. It’s a burr manual grinder that has four parts. At the top, there is a hand crank that you slide via the top position. Next, you have a lid, the main body that fits into the bottom chamber, where the ground coffee goes. The collecting area has a small glass that you can use to check the amount of ready coffee grounds. 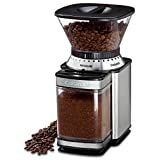 I have personally used it and to summarize the experience, it is a cheap grinder with a quality build to guarantee outstanding grinds for that one or two cups. Once you rotate the adjustment knob to the right, you get the 18 clicks by moving it to the left. 1-3 is meant for the extra fine while 13-18 is suited for coarse grinding. That is how you achieve different versions of grounds to suit that espresso cup or the French Press. Since you are doing it manually, there is a 90% noise reduction when you compare it to how the electric grinders sound. It’s also convenient to use since you don’t need a power input to make it work. The size permits you to put it in your travel bag if you need coffee during that outdoor activity. One of the things with JavaPresse is that you don’t achieve consistency though it’s acceptable with manual grinders. Another issue addressed in later models is the plastic that sits in the conical burr. It feels cheap and prone to breakage. I’m saying this since mine broke after two months of multiple uses per day. Thankfully, the manufacturer replaced the whole unit after contacting them at no extra cost. Capresso is a name blended from cappuccino and espresso. Now, here is the Capresso 560.04 Infinity Conical Burr Grinder that is whose grinding burrs are hand assembled before the packaging. The plastic on the unit is ABS, so you are guaranteed of longevity. There are, however, a few cases of the knob coming off or breaking, hence the need for extra care. Back to the grinding gear, the steel burrs have 0.1mm precision cuts which enable the machine to grind the Turkish coffee grade. For those who are asking if it can grind coffee for the espresso, Turkish needs finer grounds than espresso so there you have it. The grinder’s motor is quite slow with a good reason. As the tiny blades work on the coffee, the motor rotates at 450 rpm to make sure that heat does not build up. At the top, you have a bean hopper that accommodates 8.8oz. of beans which is quite large. Now, when you rotate the container, you change the settings on the grade of coffee you would like. It comes with 16 settings grouped into four. That means for each group, coarse, regular, fine and extra fine, you get four categories. There is a black dot on the bottom part of the hopper that shows you the selected setting. If you rotate it further from the settings, the grinder will stop immediately. It also comes with a timer that you can set between 5-60 seconds of grinding. The ground coffee goes into a tight-fitting container that holds up to 4oz. As you grind, the bean container has a secure lock to make it stay in place. You are, however, advised to empty the bean hopper to prevent the grounds from spilling out when removing the container. It’s easy to clean, but you have to do it right especially when it comes to removing the grinder. A brush is included to brush off any residue. Lastly, if you see your grinder new but with some coffee residue, it’s because the manufacturer tested it first before selling. Bodum is also another brand making coffee products and here is one of their affordable grinders for the budget coffee drinker to take home. 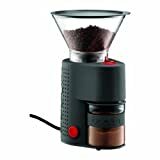 Bodum Bistro Burr Grinder comes with durable plastic construction and red buttons on the side and top for the operation. The grounds receiver is made of borosilicate glass that includes a silicon band around to help you grab it and prevent slipping. It holds 11oz of ground coffee. Loading at the top needs 7.75 ounces of coffee beans. The accompanying lid enables you to keep the beans fresh if you are not grinding plus it has a measuring guide to get you through the grinding session. Before you start, the espresso grinder allows you to choose among 12 settings, based on the description – from fine to coarse. There is some contradiction here since some customers say it has 14 settings. It makes excellent espresso, but some complain that it does not grind the French Press grade. The granules are quite smaller. Grinding itself is made possible by the steel conical burrs, but the gear feels cheap since they are plastic. The timer gives you a 5-20 second grinding window which may be less than the time you require to grind coffee. Further, you have to wait for around 5 minutes before grinding the next cycle. If you are in a hurry, you will consider that as time wastage. The gear, however, has a friction clutch. Cleaning the unit is necessary since the burr sleeve gets clogged up after a few grinding sessions, but it gets manageable on the grounds glass – it’s dishwasher safe. One thing you need to take care of is breaking the glass and losing the lid. Bodum can replace one for you, but the replacements don’t come with the rubber lids. The last item on espresso grinders is the Hario Skerton Ceramic Coffee Mill which needs your hands to grind the coffee beans. Albeit manual, it’s still one of the best espresso grinder under 100 at the moment. It’s small and compact, making it suitable to grind while traveling since it will fit in the travel bag. Looking at the structure, it comes with a top hopper which holds the arm going all the way to the bottom. The hopper is plastic made with a close to smooth texture while the bottom is all glass. The base has a rubber casing which makes the grinder steady while in use. What fascinates the customers is that it is a cheap manual grinder with ceramic conical burrs, as opposed to metal ones. That means they don’t heat up as the metal ones do, therefore, not affecting the coffee flavor. When grinding, it’s advisable to hold the unit with one hand while other moves the hand crank to gain more stability. Also, due to inconsistent grounds, try to move the crank in a slow-to-moderate speed. Faster movements make the grinder vulnerable to damage not to mention that it will be compromising your coffee beans. It’s not clear how long it takes to grind beans, but after trying with about 60 beans (enough for two cups), it took almost 40 seconds to make the grounds. That’s not bad even when in a hurry. One of the things you have to deal with is the loosening crank after a long duration of grinding. Retightening it does the trick though. Another thing, customers complain about receiving a fake Hario. Well, here is how to tell if yours is a real one. The fake one comes with a smooth glass while the real Hario has three lines on the glass. The real one also comes in a labeled box as opposed to a brown box with no labels. Last but not least, the actual unit has a metal ring on the bottom. The fake one does not come with a ring. So, be aware! Now that you have gone through the best espresso grinder under 100 reviews, you maybe still want to know what I’m voting for as the best. Well if I was to go for an electric one, that would be Capresso 560.04 Infinity Conical Burr Grinder. 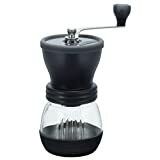 It has fewer maintenance issues and it’s a conical burr grinder as opposed to the Cuisinart which possesses flat blades. For the manual grinder, I’ll go for the JavaPresse since it has more adjustment settings and you can carry it while on the move. In all our reviews, nothing here will break the bank and my hope is that the reviews have cleared the confusion brought by choosing the cheap grinders.